Kirk Hall is a magnificent space featuring the unmatched beauty of the original building. High ceilings, elegant columns, and marble floors lend themselves toward a classical and grand affair. Dimmable lighting controls to set the exact feel desired. 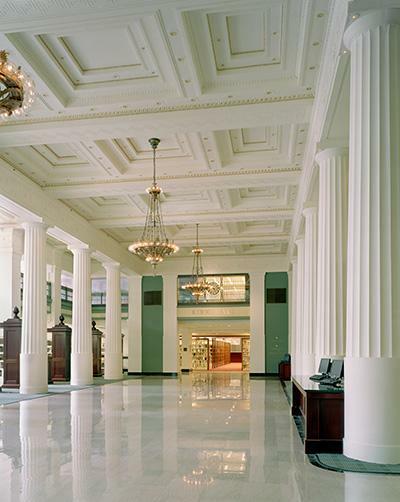 Multiple service areas & access points throughout the Library’s largest event space. Use of Kirk Hall is restricted to events that fall after normal library hours. Library does not support any audio-visual elements in Kirk Hall other than basic audio. J. Philip Kirk, Jr., former chairman of DST Realty, is the man behind the concept of creating the First National Bank building into a first-class downtown library. It’s been said he approached Jonathan Kemper with the idea as well as a well-laid out plan for raising funds. In December 2002, the Downtown Council recognized Kirk for his vision and stewardship of downtown and established an annual award in his honor. The Kirk Family Foundation has supported many projects besides redevelopment of downtown, especially the West end and the library, including the Folly Theater, YMCA, Boy Scouts, and Cancer Society’s Hope Lodge.